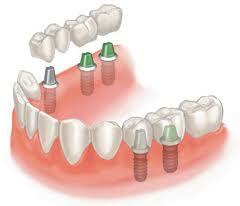 Dental implants can be a great solution for replacing several missing teeth. As with one missing tooth, multiple missing teeth can be successfully replaced as well. Implant supported teeth are permanently fixed in the jaw, in contrast to partials or dentures, which lay on top of the gum tissue. There is no worry about implants moving while speaking, eating, or participating in activities. They are placed directly into the bone, and because of this, they help preserve the jawbone and prevent further bone deterioration, which otherwise occurs once natural teeth have been removed. Teeth fixed onto dental implants look, feel, and function like natural teeth, and will last a lifetime!